You’re Loved No Matter What – A Book Club! 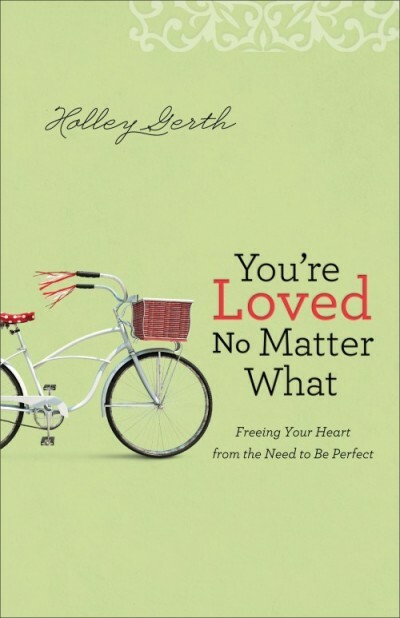 Holley Gerth shared about the message of her new book about a year ago as I sat at a table with her some other God-sized dreamers. I remember nodding in agreement that this message needed to be shared. I knew then and still know that laying down perfection at the cross is a necessary message because it’s one my soul needs. I’ve been journeying away from perfection and toward grace and joy. The process has been like leaving the darkness and walking into the light. What’s been so hard about it all is letting God reshape my natural tendencies and change my expectations. What’s been really encouraging about the whole process is how God intertwines so many books, friendships, conversations, blog posts, songs, and moments to teach me. I am loved no matter what. There’s nothing I can do to change what Jesus already did for me. I read the first few chapters in one sitting recently and felt like she was writing for me. But I know I’m not alone in needing this message. It’s the kind of practical wisdom that would thrive in discussion with other women. We can share our struggles and the ways God has redeemed them. So beginning March 16, I’m going to host an online book study of “You’re Loved No Matter What.” The book officially releases today! We’ll take the book a chapter at a time as I post discussion questions each Monday. It’ll be a private Facebook group so what you say there is safe within the group. You can join the conversations as your week allows. While I hope those who commit are invested in sharing and encouraging, I can promise you there will be grace. I believe this book will prompt conversations we as women need to have – with God, with ourselves, and with each other. Who’s in? Please comment here with your email address and Facebook name (if we aren’t already friends there and you doubt I have your email address) or email me so I can keep you informed and get you added to our group. Meanwhile, please make arrangements to get the book and read the introduction and first chapter by March 16. My book came last night!! So excited to get started! Yay! So glad you’re part of the study and I’m looking forward to us all diving in together! Ordering my book today! Eager to be a part of the book study. I’ve got you added to the discussion group! Yay! So glad you’re there, Kim! Looking forward to getting to know you. So excited to dive into this. My email is abigail.mcdonald7@gmail.com and my Facebook name is Abby McDonald. Hi, Abby! I’m glad you’re going to join us. I’m sending you an email invite via Facebook now to the private group. Let me know if you don’t receive that invitation on email or Facebook shortly. I got my Kindle version of the book yesterday and have already been eating it up. The idea of the group meeting is great! I am traveling during the start up but will try to connect when I can. My Facebook name is Jill MacKay Weatherhead! Sounds great! I’m sending you an invite to the Facebook group now via your email address, so let me know if you don’t get that soon. I got the email but the link didn’t work to connect me with the facebook page for some reason. I’m already enjoying the book. Would love to join the book club. I’m going to send you an invite via email to the private Facebook group. Let me know if you don’t receive it. I just sent you an email. I just bought the book today and cannot wait to start! I just sent you an email and already own the book! I preordered it because I absolutely love Holley’s work. I don’t have Facebook so that is my only problem. Will I need it to be a part of this? I’m new to all this technology that you amazing woman are using to stay connected. I have no doubt that this book and possibly this book study is exactly what God wants for me right now. There have been so many messages that he has shared with me in the last few weeks directing me to this. I hope I can be a part of this special group! Hi, Tammy! I just sent you an email invite to the Facebook group. Let me know if you have any trouble receiving that or joining the group. Looking forward to having you! Hi Kristin. I would love to joint the book club for this book. I am waiting for the book to ship. Can I get a copy of the questions because you will probably start before my copy of the book arrives! Please and Thank You! I just sent you an email, Madeline! Glad you’re in! Hi Kristen…been busy trying to be perfect at life and just noticed the email. My email address in followerofchrist66@hotmail.com my facebook name is Wendy-Lee Yrjola. I SO NEED THIS STUDY!!!!! Hi, Wendy! We’ve already started and will be discussing chapter two next week, but you’re welcome to join us. I’ll send you an email with info. Thanks!